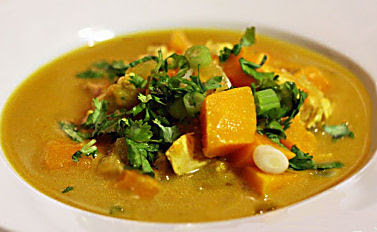 MY DAILY PUMPKIN RECIPE: Curried Butternut Squash and Chicken Soup. Curried Butternut Squash and Chicken Soup. A cold and wet January in London calls for something that is tasty and heart warming and this soup ticks all the correct boxes. Not only is the soup tasty, but it is ready and on the table in about twenty five minutes, so it is still very do-able after a hard day at work. Heat the oil in a large heavy pan and sauté the onions, garlic, and ginger in the oil for about five minutes. Add the curry paste and stir well in. Add the coconut milk, chicken broth, fish sauce, chili sauce, squash, and stir again . Bring everything to a boil, and simmer for about fifteen minutes until the squash is al dente. Add the chicken, sugar, and salt and simmer until the chicken is cooked through and the pumpkin done. Taste to see that it has sweet, tart and spicy balance, top with cilantro and serve with lime wedges dipped in salt.